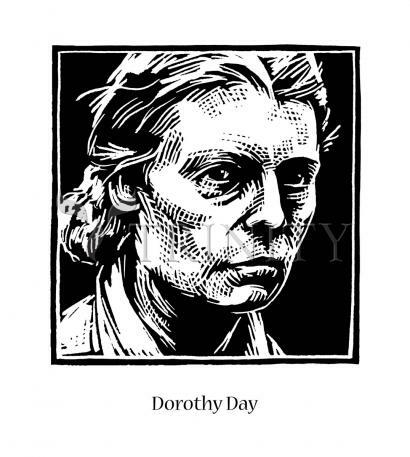 Dorothy Day, co-founder with Peter Maurin of the Catholic Worker movement, devoted her life to serving the homeless of New York City. She used her skills as a journalist to promote world peace and advocate for the poor. She founded and edited the newspaper The Catholic Worker, which is still published today. "What we do is very little. But it is like the little boy with a few loaves and fishes. Christ took that little and increased it. He will do the rest. What we do is so little we may seem to be constantly failing. But so did He fail. He met with apparent failure on the Cross. But unless the seed fall into the earth and die, there is no harvest. And why must we see results? Our work is to sow. Another generation will be reaping the harvest." A proposal for Day's canonization was put forth publicly by the Claretian Missionaries in 1983. At the request of Cardinal John J. O'Connor, head of the diocese in which she lived, in March 2000 Pope John Paul II granted the Archdiocese of New York permission to open her cause, allowing her to be called a "Servant of God" in the eyes of the Catholic Church. As canon law requires, the Archdiocese of New York submitted this cause for the endorsement of the United States Conference of Catholic Bishops, which it received in November 2012. Some members of the Catholic Worker Movement objected to the canonization process as a contradiction of Day's own values and concerns. Pope Benedict XVI, on February 13, 2013, in the closing days of his papacy, cited Day as an example of conversion. He quoted from her writings and said: "The journey towards faith in such a secularized environment was particularly difficult, but Grace acts nonetheless.